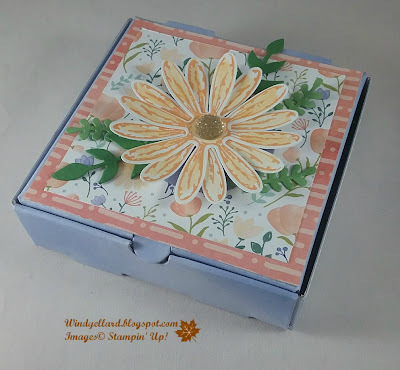 images I want to color with the new Stampin' Blends markers. I was not sure what I would do with them or if I would use together. Then I saw this challenge and it was a perfect fit! I went diagonal with Fall, Dies, Gold. and layered on a banner of gold foil. I added a gold metallic enamel shape for some more bling. to it so not just emboss the paper. dabbed the in on the white paper lightly. It did make a cool effect. Maybe what the wind looks like when blowing...that might be a sketch! 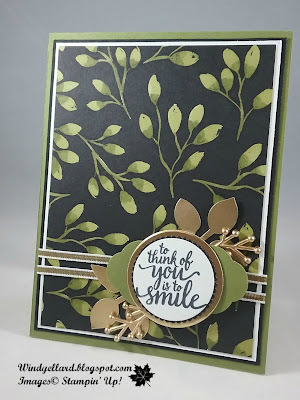 Old Olive, Encore gold metallic ink-non SU! for a friend who was giving them to her employees with a their bonus. 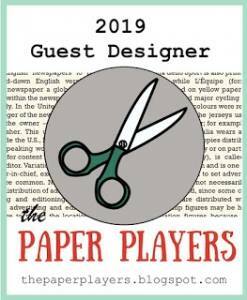 I cut the thick Whisper White card stock base at 6" by 6 1/2"
and score the 6' side at 3" to make a 3" by 6 1/2" card so it would hold money. I used the Naturally Eclectic DSP with the some Night of Navy behind. 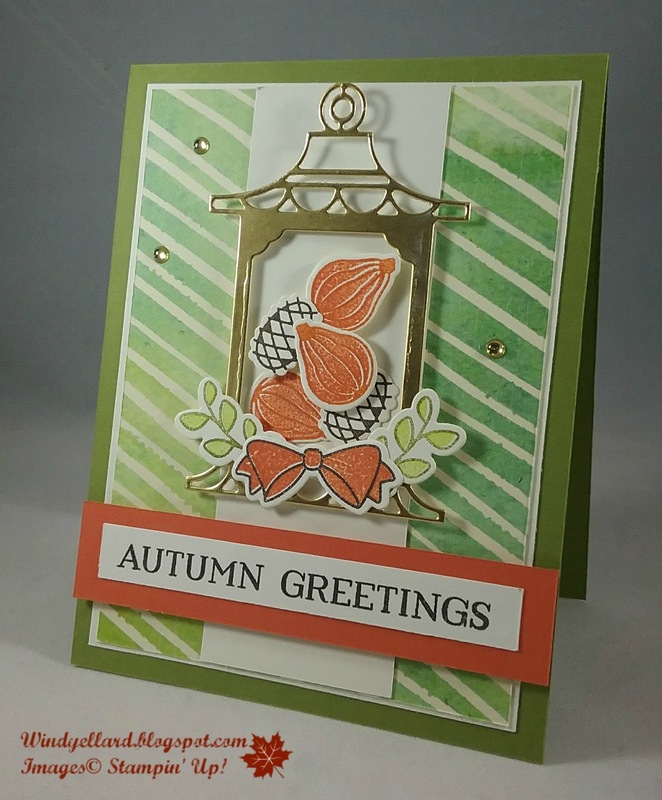 along with a Navy oval with the Layering Oval framelits dies. 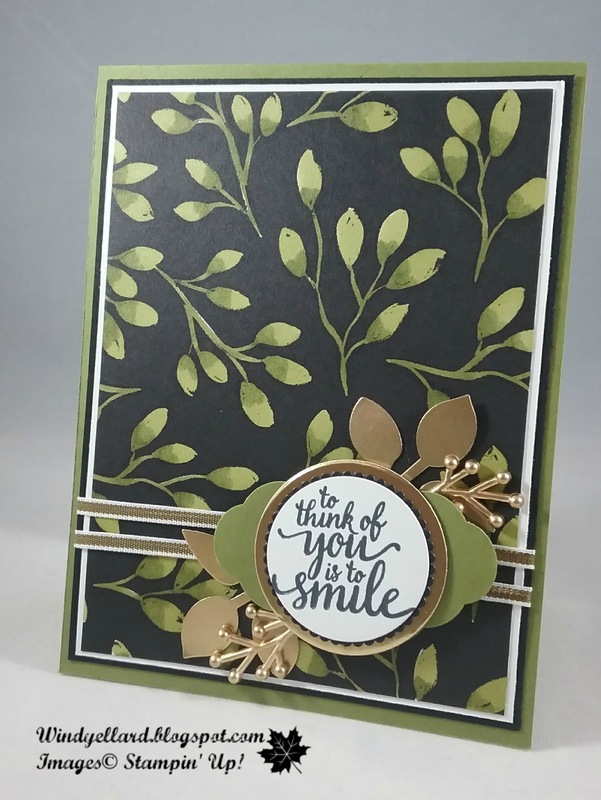 I added some Emerald Envy leaves punched out with the useful leaf punch. FabFri124 Hello Fall & Pumpkins! That is a whole lot of orange which is my least fav color. 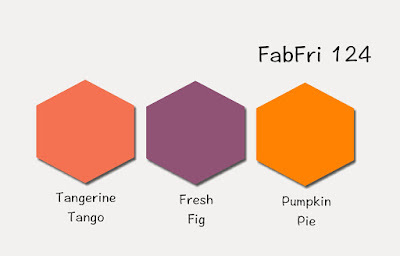 stand out more with the two oranges accenting. 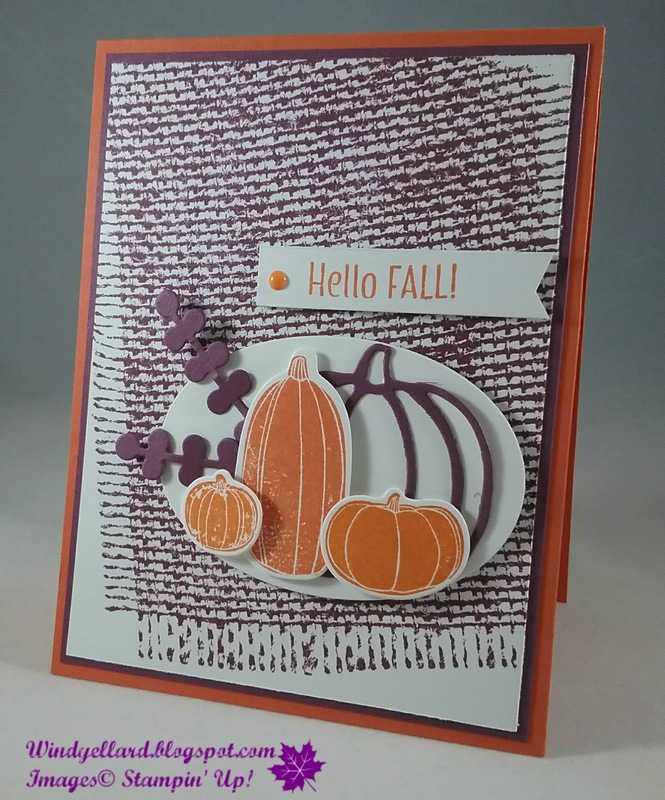 with matching does called Patterned Pumpkins. 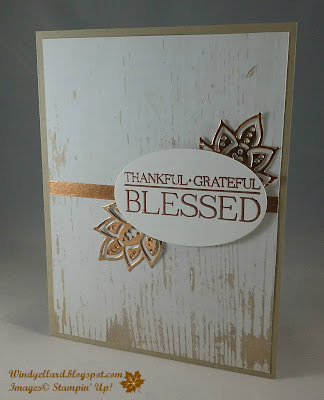 Burlap background stamped on a piece of white in Fresh Fig. I layered those on Fresh Fig card stock with a Tangerine Tango base. I love the background's texture! Well, I had to go purple since it is my fav color! Sweet Sugarplum and designed from there. I went for the middle row across with purple, free and sequins. fresh Fig and cut with the Layering Oval dies. it makes it fells more fall..maybe? I knew when I saw the sketch challenge I would make it work! stamped over with the patterns inside in Real Red. in Very Vanilla. 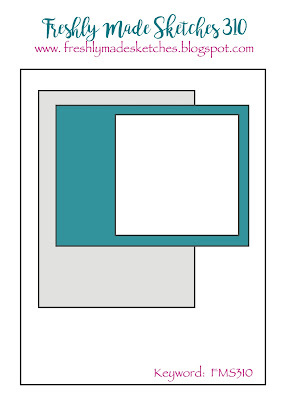 I layered it on a rectangle of Real Red. Old Olive pines and a Natural gold bow in my scraps. I also added a gold year of cheer embellishment as well to finish it off. and the leaves with markers. and same with the Cherry Cobbler one behind. thick Whisper White base...love then stripes! Cherry Cobbler stitched ribbon and bow to finish it off. 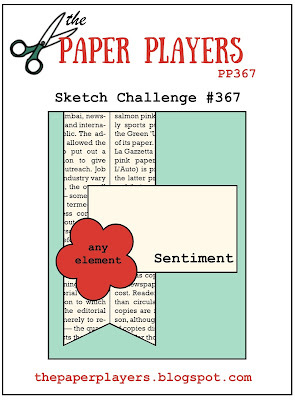 Hope you can play along with the sketch challenge this week! 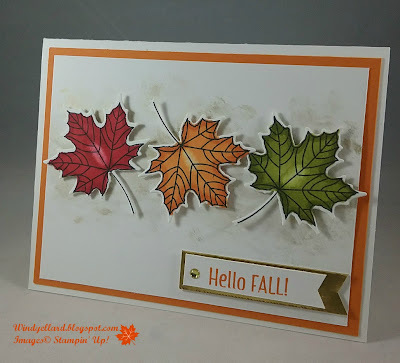 I grabbed the Painted Autumn DSP and pilled colors from there. 3D emboss folder. I added the Painted Autumn DSP strip down on the side. I stamped the sentiment from Labels to Love set which I cut with a circle die. Everyday Label punch. I the sentiment and the label in Cajun Craze. The label on Soft Sky pulling the color from the DSP. 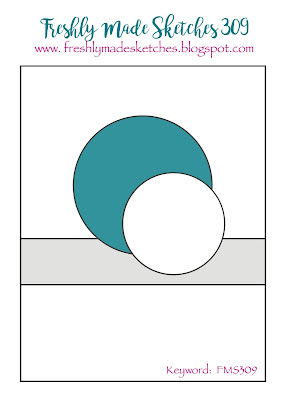 I a layered a Very Vanilla oval behind those. It added some burlap trim behind the oval as I layered it all on. 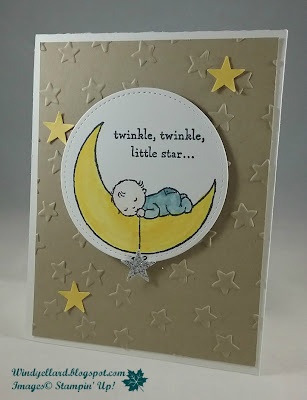 I really like all the texture on this card! 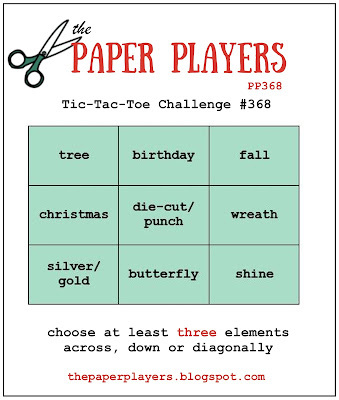 Hope you can play along with the sketch challenge! Beachy Little Christmas set all in a row and color. which will be available to all on November 1st. Stampin' Blends for the coloring. 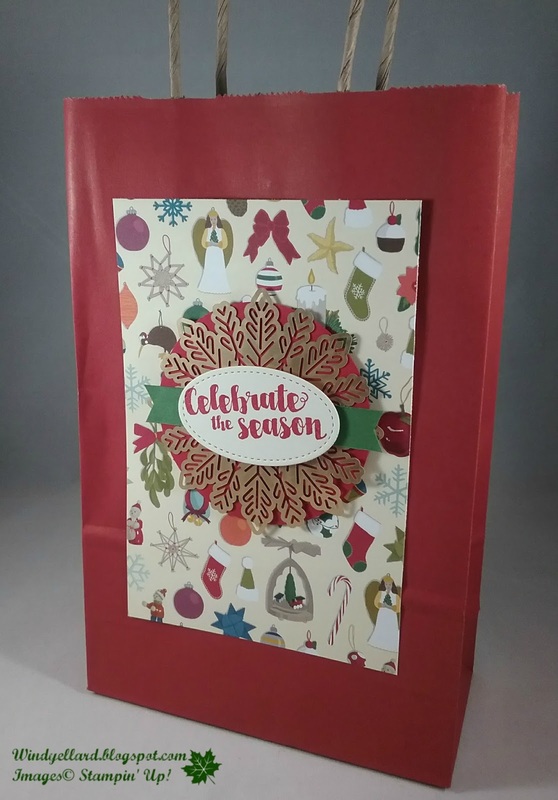 with the Pinewood Planks emboss folder. some linen thread and a Pool Party base. I need to stamp and color some more! 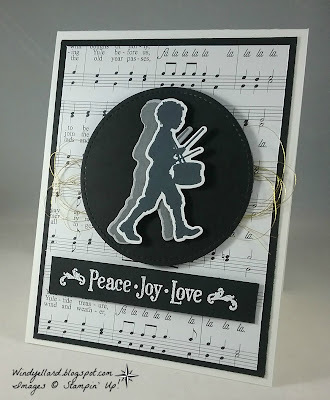 I played the first column down with Peace, Metallic Thread and White. Tuxedo Black and cut him out with the matching die. on Smoky Slate but did not use. I thought he needed to be a shadow for this card! 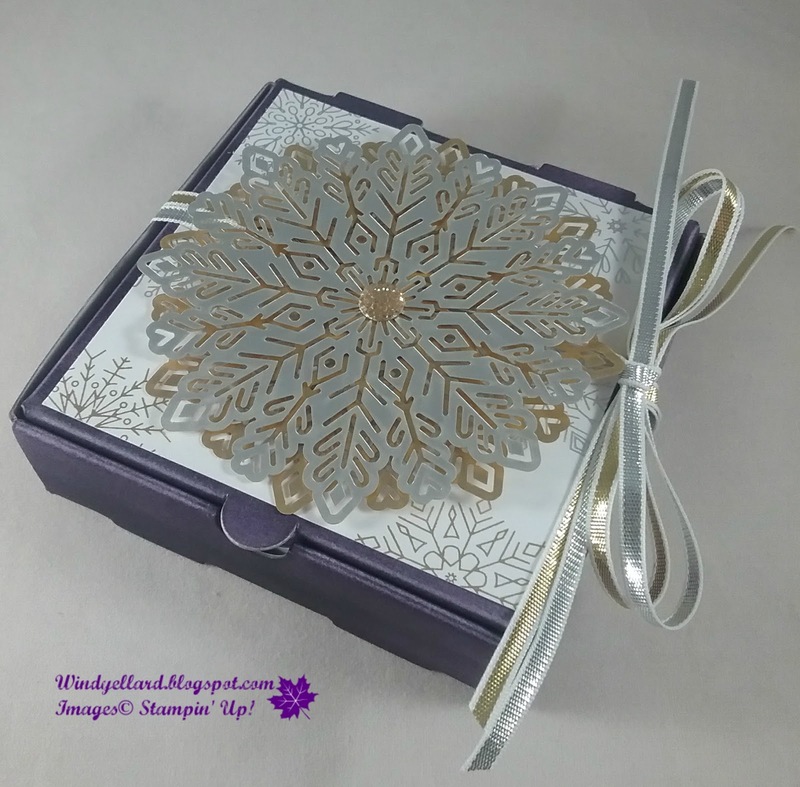 it with white emboss powder. because I think it would not have shown up. I used gold metallic thread behind the circle. I thought my new Hug In A Mug stamp set would be great for the Freshlymadesketches.blogspot.com sketch challenge. Real Red DSP from Christmas Around the World. I like the stripes along with the red, green and brown in the photo. I stamped the mug in Chocolate Chip and the sentiment in Real Red. it with a Garden Green stitched circle. and there was the heart looking perfect for this sketch! 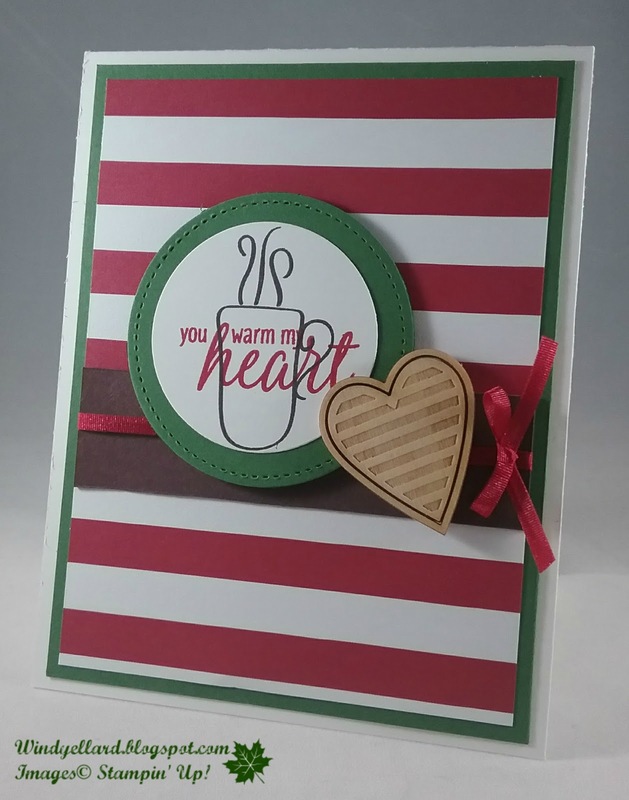 I think anything is cute with red stripes! something inspire you this week! 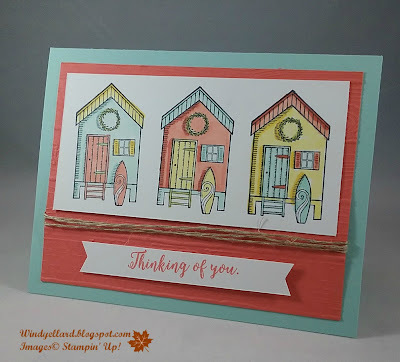 and colored it with the new Stampin' Blends coming to all soon. dark and the light colors. 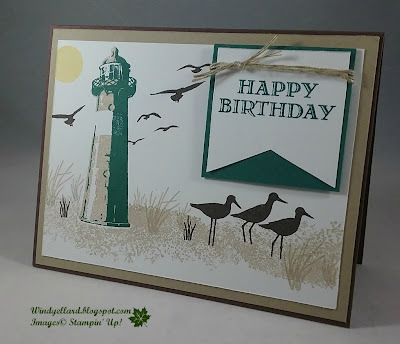 to finish up on a Pretty label cut with Old Olive. gold foil leaves from the leaf punch. The finish it up with some Year of Cheer embellishments in gold. fit into my FabFri sketch challenge this week! color combo (with a small So Saffron sun). I bought the red bags at the dollar store. I knew this sentiment and DSP would go so well together. before the deadline but I am glad I did! 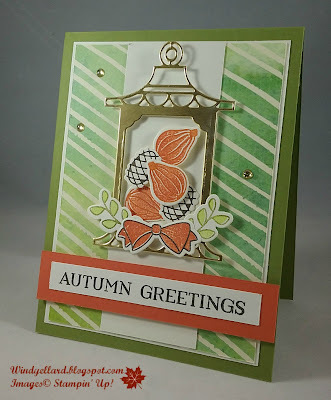 I decided to go Green, Gold, Autumn with the diagonal row. 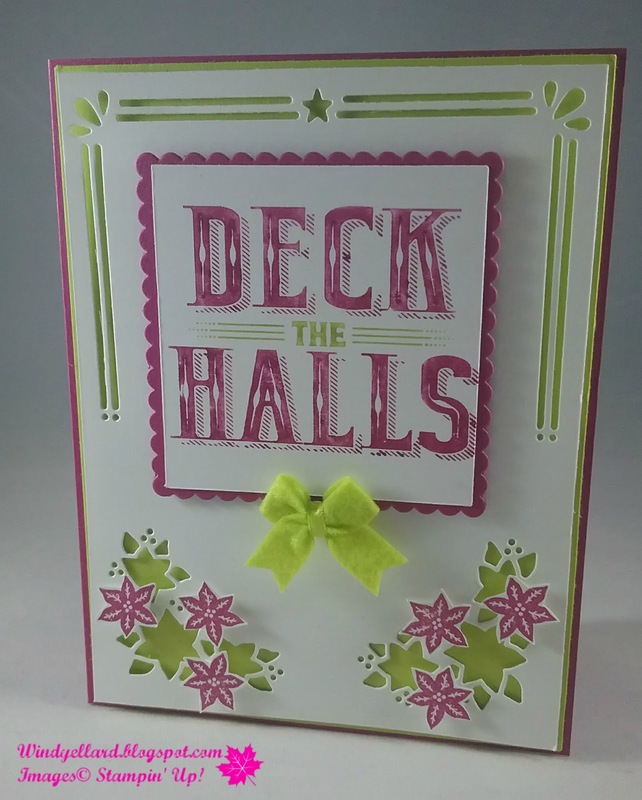 This card has a few greens with Old Olive and Lemon Lime Twist. few shades of green in it. I then cut the lantern with gold foil. as well as the bow which was filled in with Tangerine. All were cut with the matching Lantern Builder framelits dies. and added some Tangerine card stock behind. in hopes the lantern would look like it was hanging! A few gold metallic shapes finished it off! 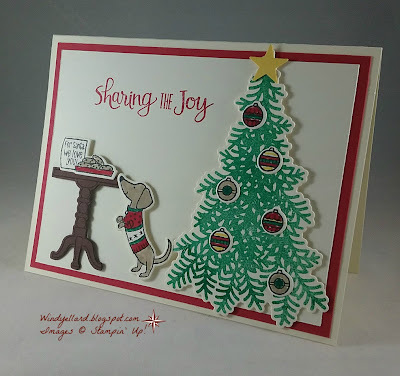 Cute card for my last Christmas card for October class! I decided it had to have the dog, the table with cookies and the tree. I got it all in plus lot of ornaments! with a retired mini star punch. I stamped the table on Chocolate Chip with the black ink. 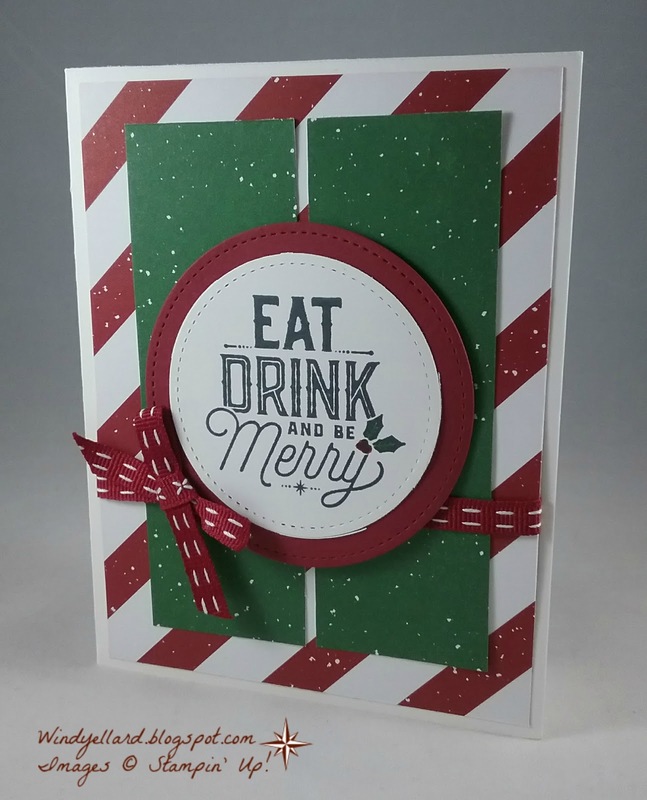 or Season's Greetings would be nice, too! What a cute scene with the Ready For Christmas bundle! 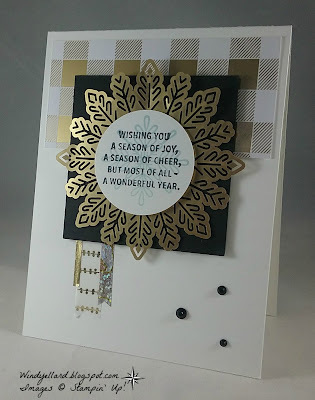 I love this 4th card for card class this month! 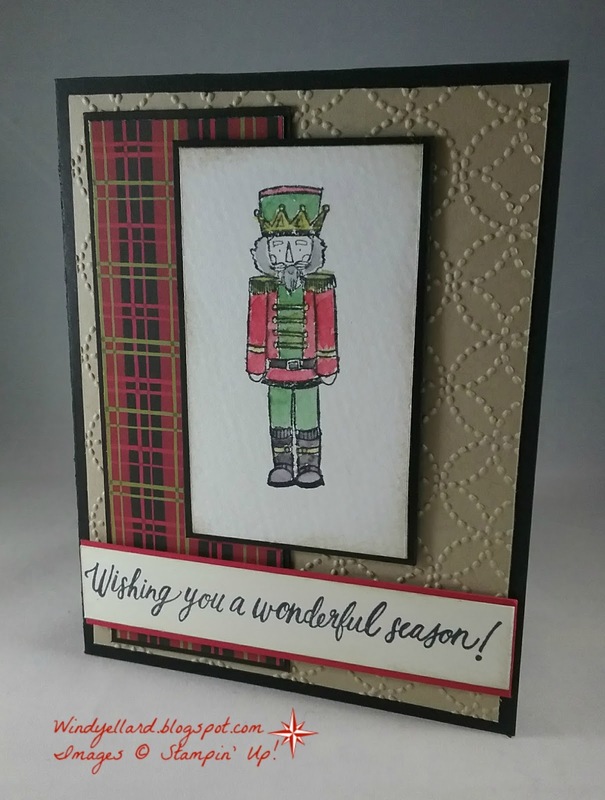 I layered that on white piece and a Real Red base. stitched circle and then stamped the drummer in Real Red and die cut him. collection that takes up a large buffet top during the holiday season. So I was excited to get this set and water color the nutcracker! 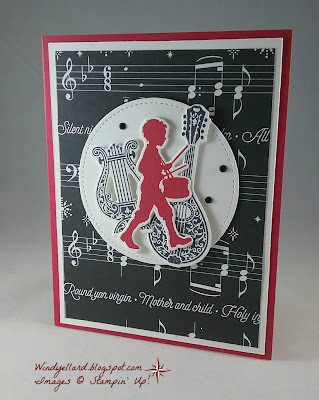 I stamped him on water color paper in Memento Tuxedo Black. I used Real Red, Smoky Slate, Basic Black, Garden Green and Crushed Curry. Around The World DSP also layered on black. Quilt Top textured emboss folder. 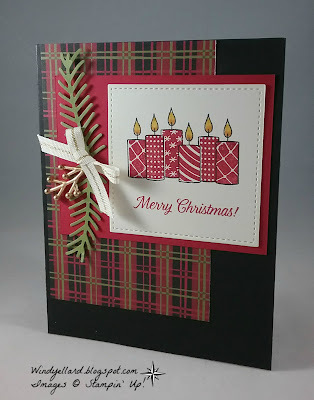 I really like the texture and the pop on a Basic Black base. on Very Vanilla with some Real Red card stock. I hope the class loves this card, too! 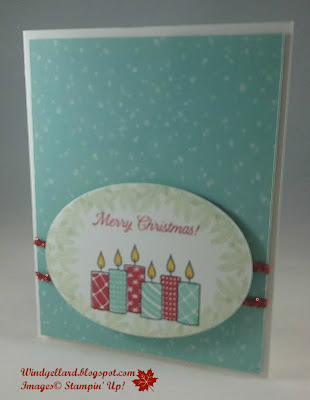 Second card for my Christmas card class. There are so many awesome designs for this set and matching dies. Stephanie Pike in Australia. I did a lot of casing of her card. 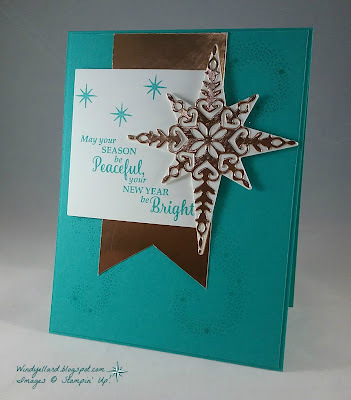 I especially love the Bermuda Bay with the copper foil! 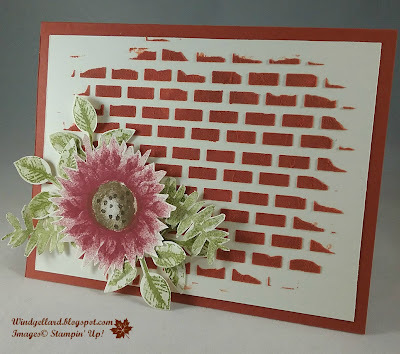 which gives lots of room for stamping! on a Bermuda Bay base. 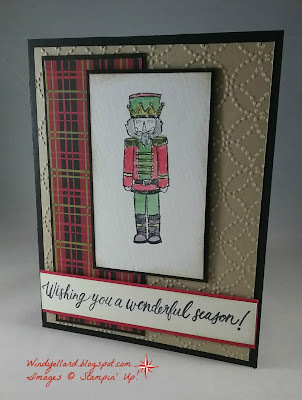 First card for October Christmas card class. I love the reindeer in this set so I had to stamp three! I added a rhinestone colored red to one nose! 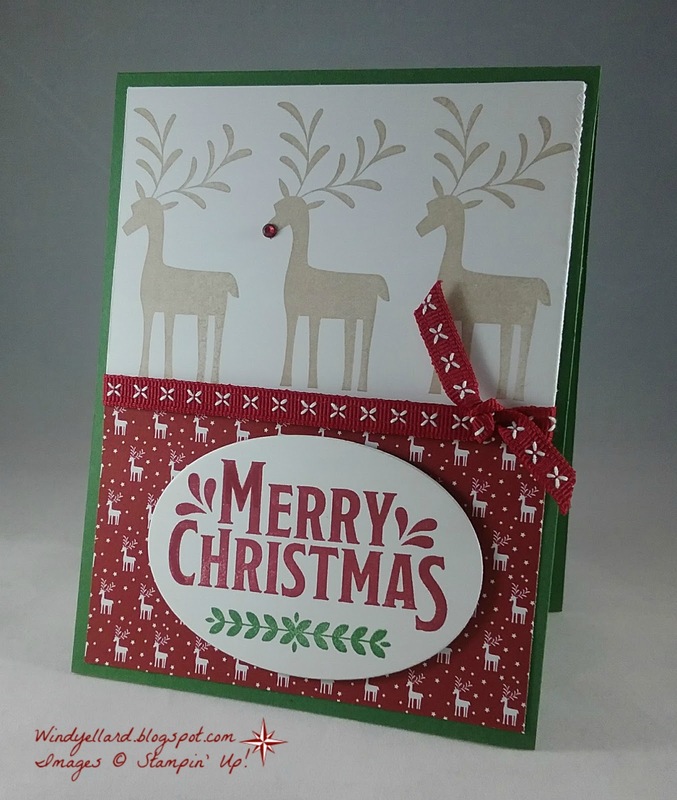 The reindeer are stamped in Crumb Cake on Whisper White. 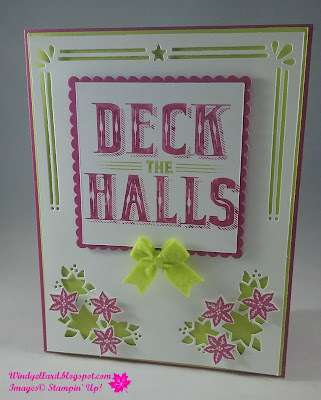 middle then layered it all on a Garden Green base. 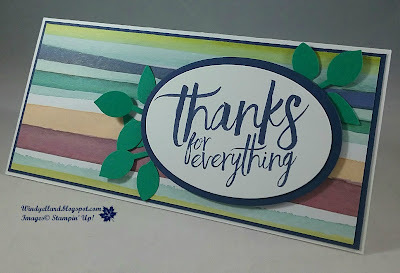 I really wanted to use this sentiment...love the size and font! the bottom in Garden Garden. I made another mini pizza box for my step mom's birthday day. I am placing a gift card and a mini card inside. These come in a pack of 8 for 6.00. Great deal but they are white all over. Night of Navy ink. It came out light so it looks purple like I like it! 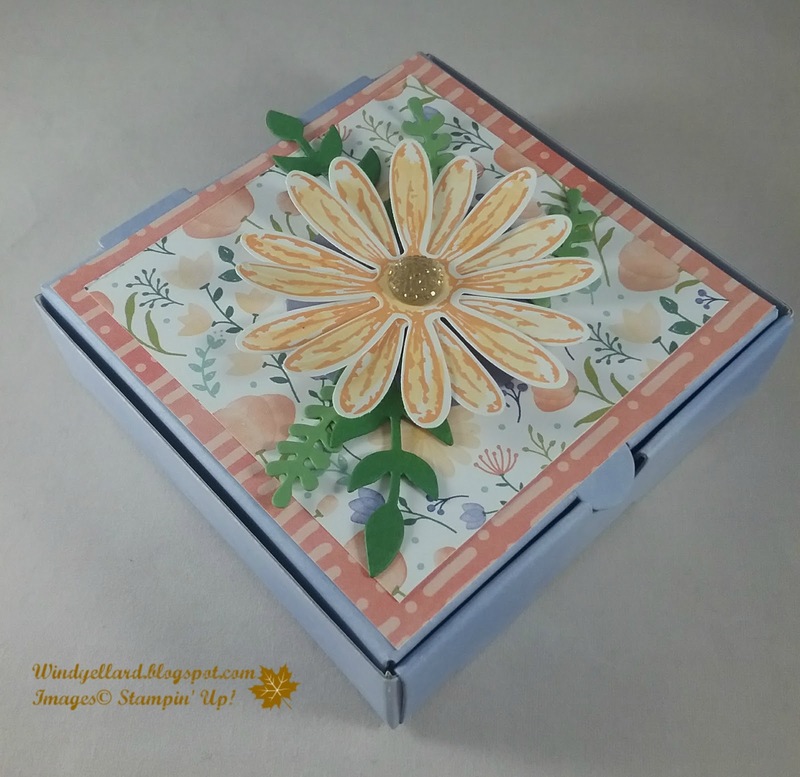 I layered the Delightful Daisy DSP on top in two prints. and washed some of the same color over it. a gold faceted gem in the center. in two greens- Wild Washi and Garden Green. I jumped the colors and sketch. thick Whisper White card base. I added a black square so you can see the gold snowflake really well. I used my Year Of Cheer washi tape for the banners at bottom. over a snowflake from the set in Soft Sky. I punched it out with my 1 3/4" circle punch. It needed something else....oh black rhinestones would be perfect! 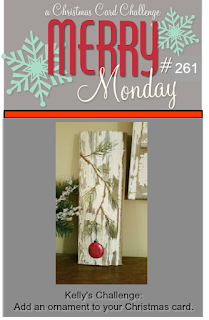 being used more and more in Christmas decor! It does not look very sharp but more water color and I like that. with the Card Front Builder thinlits. and stamped the flowers and hand snipped them all out. I finished it off with a Bitty Bow in LLT. I already thought of who I will send this to for Christmas. 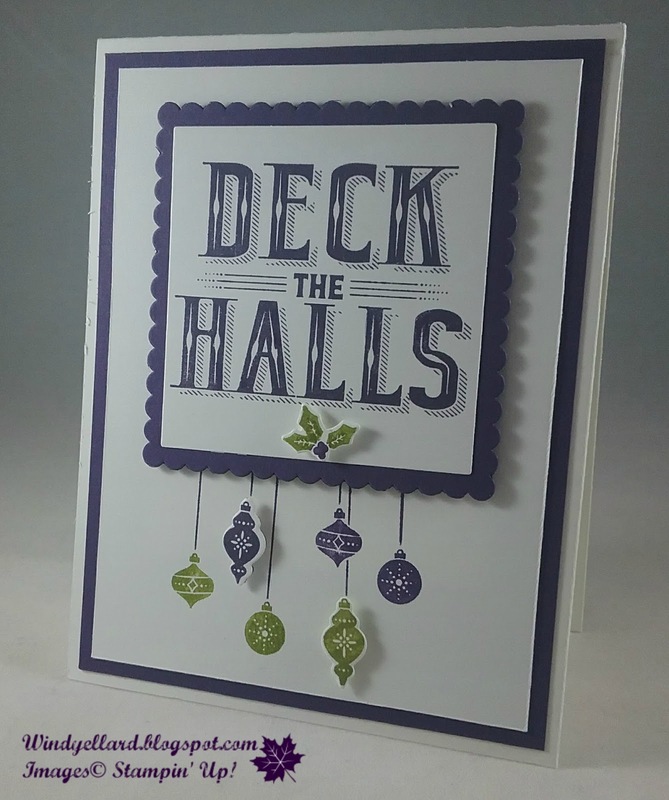 and stamp the deck the halls sentiment and the ornaments. But I stood staring at what colors to use for sooo long! I then thought why not grab my fav color-purple! 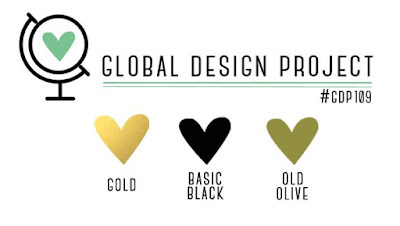 I did and Old Olive always works with it so there is my color combo! 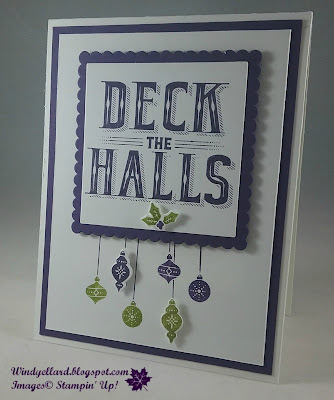 I used makers to ink up the ornaments and string. The sting in Elegant Eggplant altering the ornament with each color. piece and die it out for the finishing touch. Nice , simple and clean! Hoe you enjoy your day and thanks for stopping by! mini pizza box from the holiday catalog. It comes white all over and I colored the outside purple-my fav color. rubbing alcohol and drops of Elegant Eggplant. sponge brayer and rolled on the same ink. Worked really well. 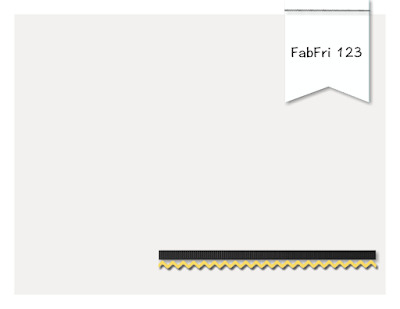 then 1/8" ribbon in both gold and silver. I layered two of the metallic foil snowflakes on top. It comes with 12 in gold and 12 in silver with the backs side in white which can be colored. 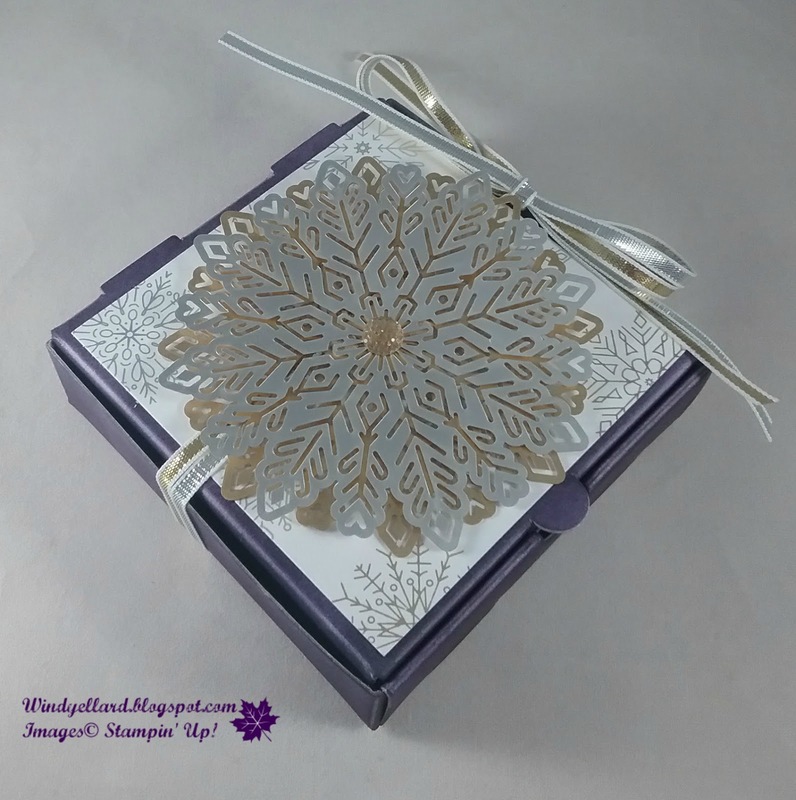 take away from the lovely foil snowflakes. Inside is a Starbucks gift card to enjoy! with my fellow demos and Pretty Pals. a card for someone special today! 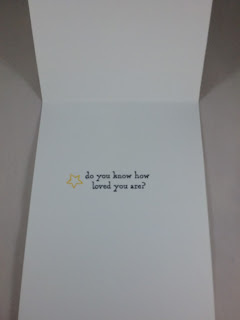 who asked me to make baby shower cards for her daughter. which I cut with the clouds from Up & Away thinlits dies. few I cut with silver glimmer paper. with Pool Party and Blushing Bride. Love the sentiments in this set and used two on the front this time. 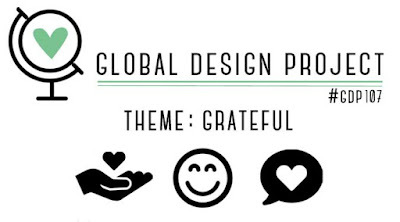 I hope you have a wonderful World Card Making Day! for her daughter's first and second baby showers this month. I do not own baby sets really and go about 3-4 years in between making them. I did keep the Zoo Babies set after it retired to use if I needed one. 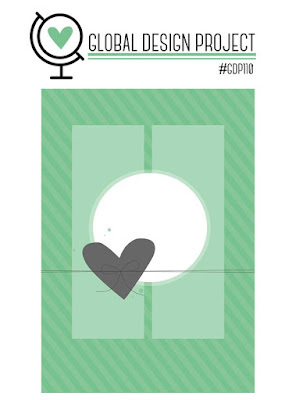 is really cute to make the cards. Marina Mist, and Blushing Bride inks. out with a retired punch. I added a silver glimmer paper star for the bling! I wanted something simple and I keep grabbing the copper foil. 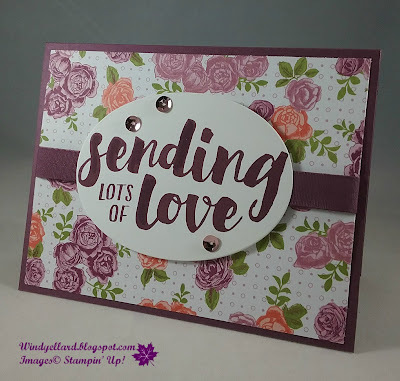 the sentiment from the Paisleys & Posies stamp set. I cut it with the Layering Ovals. and layered it on a Crumb Cake base. 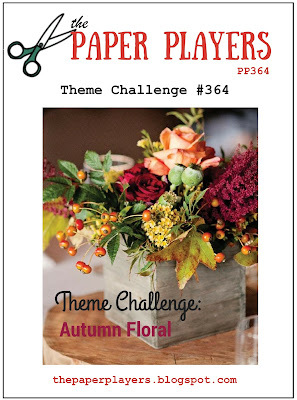 with the theme challenge this week. I started this card with the flower. in Cherry Cobbler and the center in Soft Suede. I added some dots to the center in Chocolate Chip. and punched them with the matching leaf punch. brick wall stencil on Very Vanilla card stock. All was layered on a Cajun Craze base. I can use it for any occasion this fall. Using the same DSP from Christmas Around the World as I did yesterday. "color them in" I used Real Red and Pool Party. and added some Pear Pizzazz branches around the oval. I added some bling with the Real Red mini tinsel trim behind! 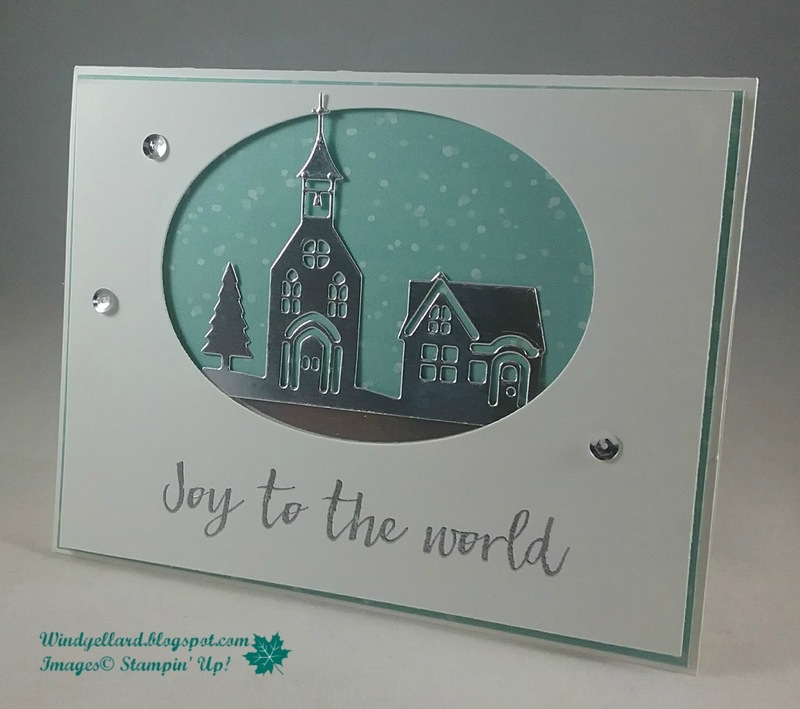 for a window and added the silver foil dies. and heat embossed it in silver emboss powder. I added some silver sequin for more bling!